I can name a handful of close-up encounters with nature that have changed my life. One was snorkeling off the coast of Maui in 1998, where a green sea turtle sidled up to my face mask and seemed to want to get to know me. 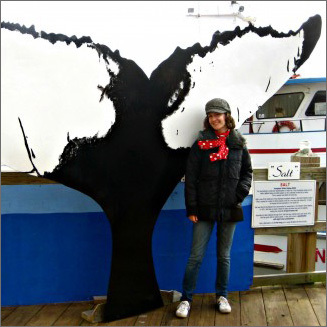 Another was going on my first whale watching trip from Provincetown, Mass., in 2007. I remember this trip for three reasons. Poor Shannon Leigh O’Neil got horribly seasick. We found more than 30 humpback whales moseying through Stellwagen Bank Marine Sanctuary. And the naturalist on board was so flabbergasted by the number of cetaceans that she kept shouting, “Whale at 12 o’clock! 4 o’clock! There’s one at 6:30!” through the microphone. I knew whale watching was a magical experience in the natural world. Now a study released by the Whale and Dolphin Conservation Society (WDC) proves that whale watching also inculcates a greater concern for marine mammals and marine conservation among people who go on the trips. This is the first study that looked at an interest in marine conservation and whale well-being as possible results of going on whale watching trips. Previous studies had only examined the economic benefits of the whale watching industry. The results showed that whale watchers didn’t know how to support the conservation of marine mammals before the tour started. Afterward, respondents had become more aware of conservation efforts and were alarmed about the health of marine environment. The key is responsible whale watching. Companies that respected the guidelines to responsible whale watching, like keeping at least 100 feet from a whale in the open ocean, and those which had naturalists on board to explain whale conservation, had the most success in steering people toward a conservation mindset.